These trousers don't fit anymore! 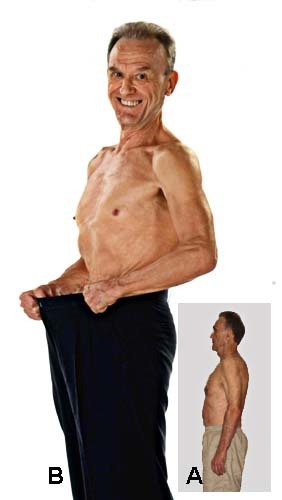 Fat loss is great, but you better be prepared for the side-effects: your trousers won't fit anymore! In August 2003, I started walking a few hours per week. Over 12 months my weight dropped only 11 pounds, from 169 lbs (77 kg) to 158 pounds (72 kg). My waist size went from 37 inches (94 cm) to 35 inches (89 cm) and I bought some trousers with a 34 inch waistband. Photo A was taken in February 2005, after I lost another 18 lb (8 kg). These are my old trousers that were once too tight with a waistband of 36 inches. While I lost fat, I lost muscle too, because I did not consume enough protein and did not use heavy weights. Body fat was about 30%. 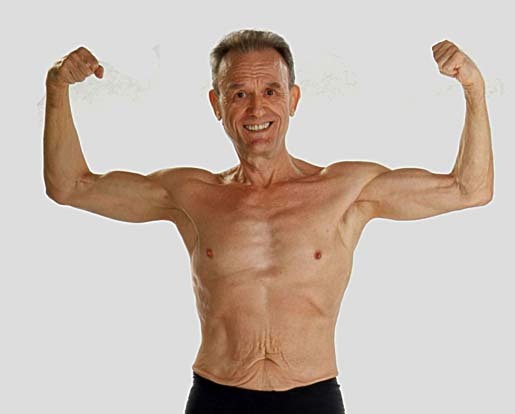 Photo B was taken one year later than Photo A, after 15 months of exercising six to eight hours per week, including three hours weight training and 30 to 90 minutes per week of abdominal exercises. I started drinking protein shakes made from whey and soy powders, fresh fruit, nuts and seeds. During the 12-month period, weight loss was only eight pounds, but body fat fell to 20%. In those 12 months, I lost about 16 pounds of fat and gained 8 pounds of muscle. Most noticeable is the effect on the abdomen of both further fat loss and tightening of the muscles. I am now buying trousers with a 30 inch (76 cm) waistband. As fat is lost, the skin sags because it is no longer supported. The remaining fat pulls the skin down by its weight. As more fat is lost, the weight of the sagging skin becomes less and the folds become smoother until they finally disappear. In this photo, you can see several abdominal skin folds that have diminished during the last six months and will continue to diminish as I lose more fat. My wife is convinced that most of the muscle gain has occurred during the eight months since I joined the Clark Hatch Fitness Center.